ith a growing environmentally friendly mindset, many people are starting to view waste in a new way. 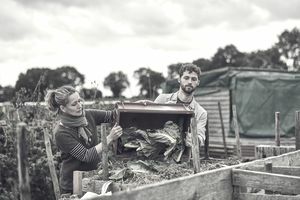 It is why composting is no longer a method of disposal solely used in rural areas; it's becoming a common way to manage waste and produce a usable product, creating a viable business opportunity. Recycling materials rather than sending to a landfill is better for the environment. A composting business is relatively easy to establish. The start-up costs are minimal. You may be eligible for tax incentives for owning a green business. There is a growing demand for the organic material. Your target markets are easy to identify, including gardeners, gardening, and landscape companies. Your business can be home-based. You can operate locally and by Internet mail order. You have the potential to create a dual revenue business (inflow of raw materials; the outflow of the finished product). You will need sufficient land and storage space to create a composting site. You may have challenges with shipping and finding appropriate compost carriers. Some degree of scientific knowledge, training and/or research is necessary. You may need equipment such as a truck for deliveries and storage bins, packaging, etc. It is very physical work, so you will need to be in good health, with a strong back for heavy lifting.